Wang Le on Friday trained at Longtanhu Park in Beijing for the Beijing marathon. 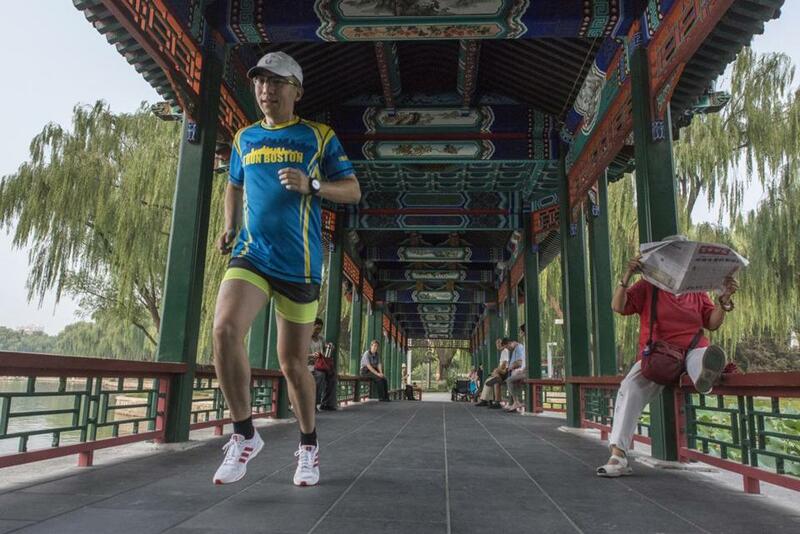 Wang, a Beijing running app developer, has ran Boston four times. TAIYUAN, China — The sun rose behind ash-colored smog as thousands of people gathered to run in the heart of China’s coal country. Many wore neon yellow race T-shirts and posed for photos before taking their places at the starting line of a pleasantly flat course that looped the river. When this northern city first started hosting races in 2010, some runners showed up in jeans, flicking away cigarettes before the gun went off. Now they sport Nike Dri-FIT clothes and Garmin watches. China is obsessed with marathons. The country will host 400 this year, up from 22 in 2011. They entice a growing consumer class that’s focused on fitness, as well as local governments hungry for revenue. But the frenzy is outpacing the preparation. Participants have gotten lost on courses. One city recently offered runners handouts of meat. So Chinese runners and organizers are looking to Boston as a guide. Chinese competitors are no longer limited to Beijing’s race around Tiananmen Square. They run through the sandy plains of the Gobi Dessert, on the Great Wall, along the North Korean border, and past former revolutionary bases in patriotic-themed races. As with many things in China, government is helping to spur the changes. Leaders in 2014 stopped requiring official approval to host marathons, which led to a surge of new races. Industrial cities like Taiyuan — in a province known for its vinegar and coal mines — viewed it as a tourism opportunity. Officials, noticing that greater consumer spending had an influence on waistlines, also sought to promote healthier lifestyles. They have carved out jogging paths near rivers and added exercise equipment near apartment complexes. Last year, China’s top administrative body issued a mandate to develop the fitness and leisure industry, with a goal of increasing the sector’s output to more than $400 billion by 2025. “Sports sets the stage for a stronger and more prosperous country,” President Xi Jinping told an athletics conference last month. But “marathon fever” — as state media label it — also grows from a consumer class ravenous for hobbies. Running gear is the new status symbol. Competitors fill their social media feeds with photos of themselves looking sweaty and triumphant. Some show off sports watches like luxury cars. 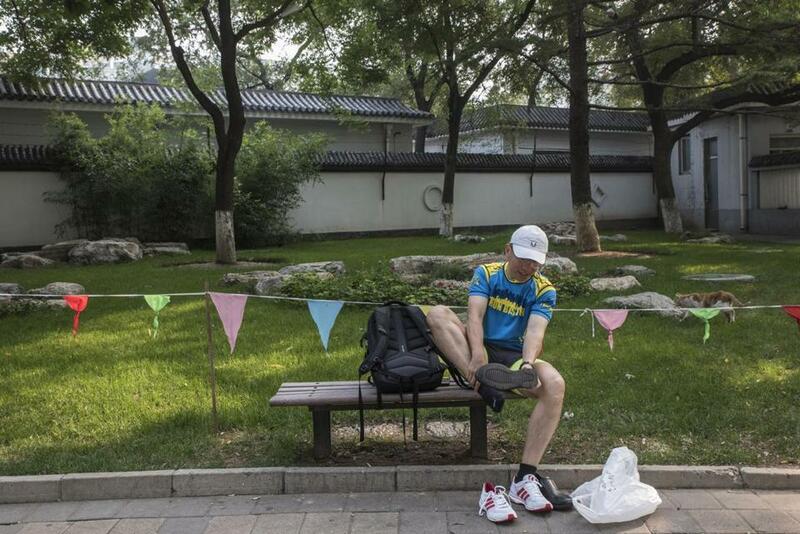 Wang took a break while training for the Beijing marathon. “Four or five years ago, middle-aged people realized marathons can make you slim and look better, and you can post it,” said Tan Jie, publisher of Front Runner, the official running magazine of the Chinese Athletic Association, the national governing body for sports. He credits WeChat, a Chinese social media platform with nearly 1 billion users, for helping to make the sport appear accessible to a population more likely to embrace badminton or Ping-Pong. He ran a particularly stifling Boston Marathon this year and wrote a piece praising the use of ice baths for runners in shock. That’s an unusual remedy for the Chinese — traditional Chinese medicine warns that ice harms digestion. Wang Le, another Boston runner who has consulted with its organizers, wonders whether the cultural differences of a 121-year-old race can translate. He remembers pounding his way through a marathon in eastern China nine years ago when a spectator started screaming. She wanted to know why Wang was still running. Didn’t he realize the winner had finished two hours earlier? “Boston has the highest-quality runners and spectators,” said Wang, 39, a running app developer in Beijing who counts four Boston races among the more than 100 he has completed. Advice to Chinese race organizers is still largely informal, said Tom Grilk, head of the Boston Athletic Association, which oversees the Marathon. Requests often come from representatives connected to travel companies. “It’s a nice problem, and almost an embarrassing one to have,” he said. Two years ago, 75 Chinese runners participated in Boston. This year, there were 278. China’s big businesses also sense opportunity. The Abbott World Marathon Majors, a prize-winning series of six world-class races that includes Boston, signed a deal in April with Dalian Wanda Group, a Chinese conglomerate that recently bought the Ironman Triathlon. The Wanda-Majors partnership aims to help expand marathons worldwide. Chinese cities are finding there’s still much to learn. Thousands of runners suffered sprains and muscle spasms last year during the second annual marathon in Qingyuan, a southern city near Hong Kong. Organizers handed out grape-scented soap to weary finishers, who mistook it for food and got sick. 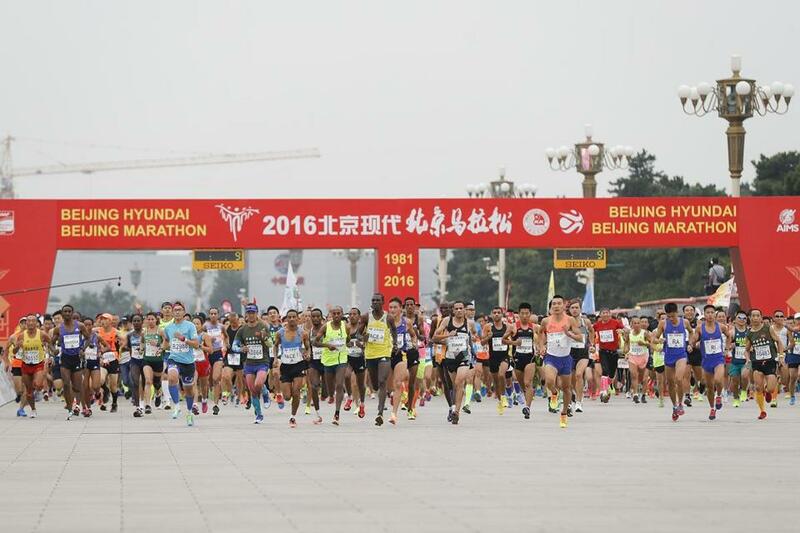 Elite runners were confused by poor signage in last year’s Nanjing marathon and went the wrong way. Top officials in the northeastern city of Changchun hadn’t finished speaking when the gun went off, so they tried to send everyone back to the starting line. This year’s Shanghai half-marathon sponsors provided thirsty runners with yogurt — which had been baking in the sun. “Sports sets the stage for a stronger and more prosperous country,” said President Xi Jingping. Above: competitors started the 2016 Beijing marathon. “Local government plays an essential role here, but its capability and efficiency vary a lot,” said Lu Meng, race director for Beijing Norton Outside Sports, which helps Chinese provinces organize themed marathons. At Taiyuan’s first race, officials doled out medals to the short-distance runners, leaving none for the marathoners. The capital of Shanxi province — with roughly the same population as Kentucky — now caps its races, including a half-marathon and a fun run, at 30,000 runners. The air during Taiyuan’s race was far from the filthiest. Images of mask-wearing runners went viral three years ago when heavy smog covered the Beijing marathon. Logan, who works at an environmental nonprofit in Beijing, qualified for Boston at another Beijing marathon. She, along with other runners in China, checks the air quality like the time and settles for the gym when it gets bad outside. The inconvenience is temporary. She grew up watching runners at the starting line in Hopkinton, but became one in China. Li Qing wants to see herself on that line. The 28-year-old Beijing insurance broker leads a group of aspiring runners who share a simple goal: to participate in Boston before they turn 70. “Once you start to run, the joy of it, what you can learn from running, is irreplaceable,” she said. “I wanted to prove to myself that, in addition to my career, I can achieve this,” said Luo Fangning, a 28-year-old engineer, who beamed at the finish line. Luo finished in over three hours and won’t qualify for Boston. He planned to try again at the Shanghai marathon, two months away. 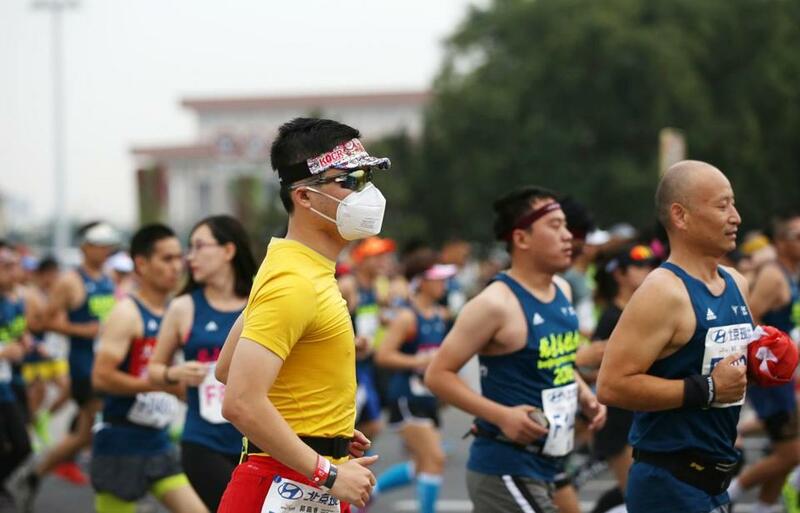 Air quality can be a concern for runners in China. Gaochao Zhang contributed to this report. Jessica Meyers can be reached at jessica.meyers@globe.com. Follow her on Twitter @jessicameyers.